One of my favorite places to go to lunch with my family is Miss Molly’s Tea Room in Medina, located just off the Square at 140 W. Washington St. #6. This is not a place to take the menfolk in your life. They will most likely feel uncomfortable surrounded by flowers, tea cups, doilies and other frou frou. We recently went there on the Saturday before Mother’s Day. We made our reservation a month ahead of time. It’s a good thing we did. The place was packed, and they had a live harpist that day, which was nice. My nieces have been going there with us since they were very little. They have always been very accommodating to children. In fact, it is a popular place for little (and big) girls to dress in their finest. On our most recent visit there was a table of older women wearing all kinds of different hats – just because. You can order the tea iced or in your own teapot (loose leaf tea or tea bags available, but a proper tea is served loose leaf and steeped for 3-5 minutes). They offer a delicious variety of teas from black teas, green teas to delicate white teas. Tea is nothing without scones. Their scones are quite good and are baked fresh every day. The scones are served with Devonshire cream and preserves upon request. 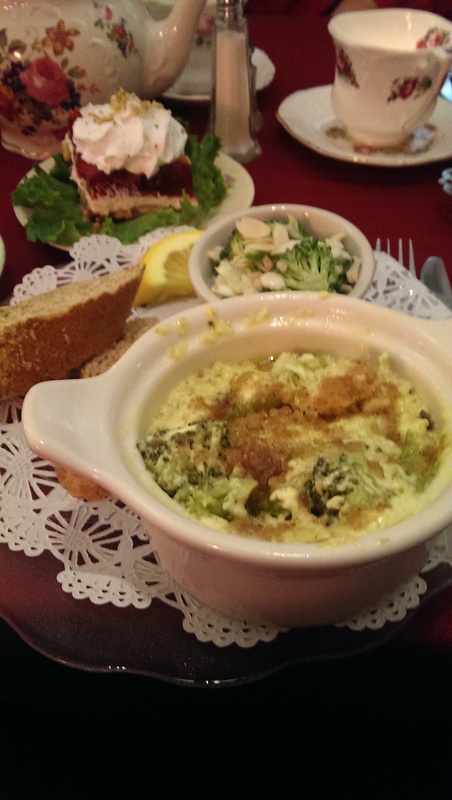 My all-time favorite meal is the Chicken Divan. I was in the mood to try something different that day though, so I ordered the tuna salad croissant. All the meals come with your choice of soup or one of their side salads. They have four delicious salads to choose from: cucumber salad in a light creamy sauce (my sister’s favorite), chilled cranberry salad (Miss Molly’s specialty), broccoli salad (one of my favorites) and strawberry pretzel salad (which is by far my favorite). I ordered both the broccoli salad and the strawberry pretzel salad. My mother ordered the crab salad puff and a side of the lobster bisque soup. She loved the fresh dill in the crab salad and remarked that the lobster bisque soup was delicious as well . My sister had the Harvest Turkey sandwich that day, but she usually orders the chicken salad sandwich. My nieces ordered Mac and Cheese and the cheese pizza off the children’s menu. The children’s meals come with a ‘decorate-it-yourself’ cookie. They love coming to Miss Molly’s, because they get their milk served in miniature tea pots and demitasse cups. In fact, they enjoy it so much that we serve them milk in tea pots at family dinners now too. I have also had the Heavenly Wrap (roast beef and roasted red peppers with watercress, fresh spinach leaves and horseradish) and the Cooper River Croissant (hot ham and cheddar cheese) during past visits and can vouch for the freshness of the ingredients and overall tastiness. Miss Molly’s also features a quiche of the day and a featured lunch. The featured lunch the day we were there was a white lasagna. One of these days we are going to order the special tea service. You need to request it 24 hours in advance. So if you are looking for someplace to take a special woman in your life I highly recommend Miss Molly’s.